Avoiding gluten-free foods doesn’t mean that you have to compromise on taste as well. With a plethora of recipes available in the cookbooks and internet, you can excite your taste buds with food items that have no gluten content in them. I’m going to share two chocolate recipes that you can try on the weekends and enjoy it with your family and friends. Again, these recipes are gluten free, so you don’t have to worry at all. Take a medium red copper pan, add some sugar, salt, and cornstarch in it. Then, add, 1/3 cup of milk and stir the mixture until it forms a smooth paste. Crack 4 eggs, and whisk egg yolks in a bowl with the remaining milk. Add the mixture to the pan and cook over medium-low heat. Stir the mixture constantly with a spatula or a wooden spoon until thickened. It will take 12-15 minutes, but make sure that it doesn’t start to boil. After 12-15 minutes, remove the pan from heat. Add Chocolate and vanilla into the mixture and stir until the chocolate melts in the mixture. You must check if the mixture is smooth or not. Keep stirring until it becomes smooth. Take eight teacups or ramekins glasses and pour the mixture into those glasses. Now, put all the cups or glasses into the refrigerator until the chocolate pots become chilled. It will take a couple of hours, so just try to hold yourself for that much time. Take out the cups/glasses and sprinkle some cocoa powder on the top of each cup/glass. 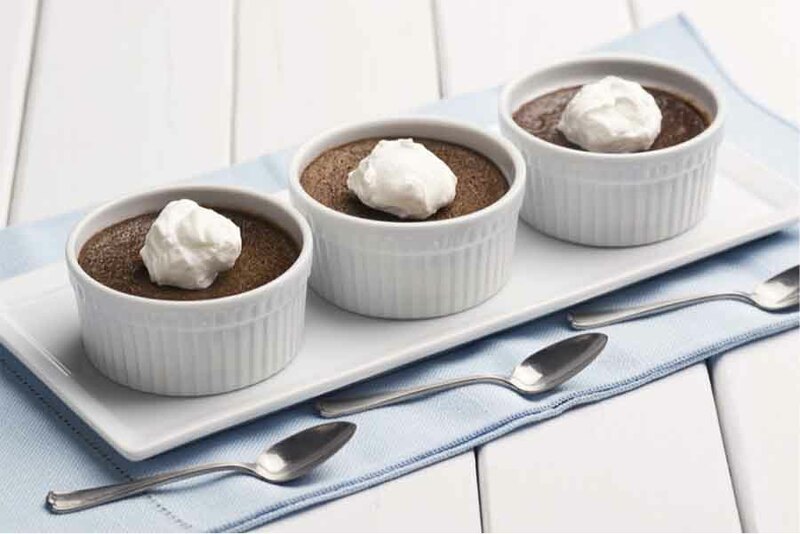 Finally, you have cool chocolate pots to enjoy alone or with your family or friends. If you have thoroughly enjoyed Chocolate pots, then this next recipe is going to take you deep inside the ‘Chocolate Fantasy Land’. The name of the recipe is ‘Flourless Chocolate Cake’, which is also a gluten-free dessert that you can enjoy alone or with family or friends. Intense chocolate flavor combined with unsweetened cocoa and bittersweet melted chocolate at the top will definitely make you crazy. This recipe is an amalgamation of cake and fudge. The texture you’re going to get would be luscious and dense, so be prepared for a memorable chocolate ride. 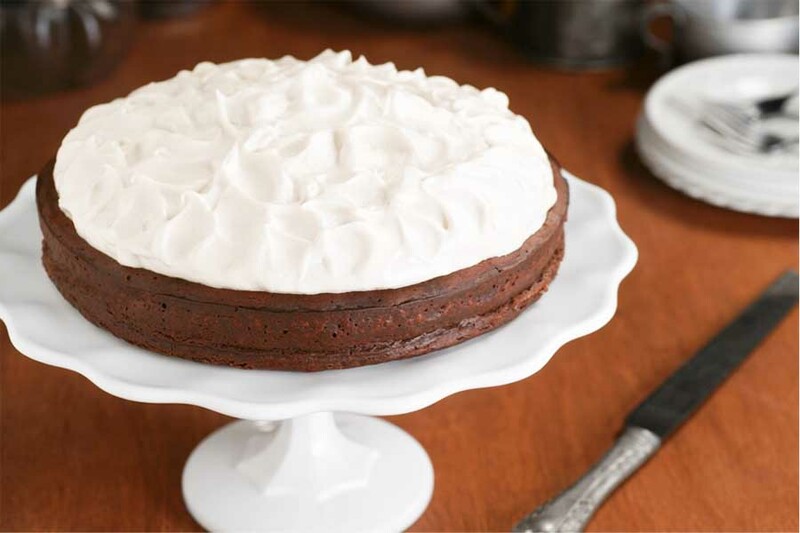 You can serve this dessert with a tangy version of whipped cream, which is going to balance the richness of this cake. For that, you can take one cup of heavy cream along with ½ cup of sour cream or Crème Fraiche. Beat both of them together until you see soft peaks. You need to prepare this whipped cream a few hours before the preparation of the cake. Keep the cream in the refrigerator and stir it when you are about to serve the whole dessert. Recipe Name: Flourless Chocolate Cake. 1 ¼ cups of heavy cream. 1 ½ cups unsalted butter, cut into pieces. 8 oz. bittersweet chocolate, chopped. ½ cup cocoa powder, unsweetened. ½ cup sour cream or Crème Fraiche. Preheat oven to 350 degrees Fahrenheit, take a spring-form pan and add some butter and cocoa powder into it. Now, take a medium red copper pan, heat butter with ¼ cup heavy cream over medium-low heat. When the butter melts, you need to add chocolate. Stir the entire mixture until it melts and gets Once it does, remove the pan from the heat. Crack 5 eggs and pour into a medium bowl along with granulated sugar and cocoa powder. Whisk in the mixture. Add the batter to the saucepan and mix it well. Then, the entire mixture will be poured into the spring-form pan and bake it until it puffs and become set. It will take around 35-40 minutes. Once the cake has been baked, take the pan out and let the cake cool in the pan for an hour. Run a knife around the edge of the cake in order to ensure that the entire cake comes out smoothly when the pan is turned upside down. Now, you have to prepare the icing, and for that, you will have to beat 1 cup of heavy cream with sour cream and confectioners’ sugar until you see soft peaks. Then, take a cocoa powder and dust it over the cake followed by adding whipped cream at the top of each slice of cake. Both recipes are quite easy to prepare and attract not just the chocolate lovers, but anybody who wish to eat a mouth-watering dessert on the weekends. Try out these recipes and share your experience. Author Bio: Monica Henin, the author of this article is a prolific blogger and a food expert. She has written various articles and blogs on food tips and healthy recipes. Check out more about her work at www.addonkitchen.com, as she remains highly active on this website.